"Beyond this gate is my vengeance." Ronin have historically been one of the most feared warriors throughout history. They demonstrate a cool sensibility amidst the chaos of combat, making them brutally efficient killing machines. If you add in the fact that they're already dead when they're fighting, then chances are you've made a worthy opponent even more ridiculously strong. Lab5 Studios offers a character in Dead Ronin #1, written and illustrated by Luke A. Brown. It's the beginning of the end as one man fights before the gates of his vengeance. Continually pushing to the limits, he's forced to contend with two outcomes: will he retain his humanity or become a monster? What follows is a lot of vicious combat and one man's struggles against demons--both internal and external. 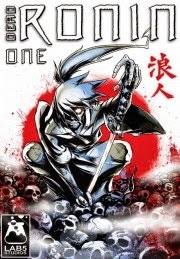 Dead Ronin #1 is something that will very familiar to fans of anime and/manga. In fact, the entire first issue is pretty much a stereotypically beastly character easily handling any and all comers, until he's faced with something that gives him some pause. Brown adds some dialogue throughout the book that primarily serves as the main character's stream of conscious. This is good because it does give more insights into what he's dealing with internally, despite being so combat capable externally. The thing is that the character is neither never named in the book, nor is he referred to in any capacity other than shrieks of fear. It doesn't take away from the book's overall plot, but it's tough to figure out who exactly everyone is fearful of and why they are so. Pulling double creative duties in Dead Ronin #1 is Brown, as he also illustrates the book. Again, there are very clear anime/manga inspirations throughout the entire book, right down to the characters who showcase Jekyll and Hyde personas. Characters are illustrated in a way that presents them as if they're posing for a hero shot, a trademark of the aforementioned influences. Some of the more monstrous appearances invoke comparisons to demons and Brown does a good job differentiating between human and monster to the point that the reader has a really good idea of who the bad guys are based on appearances. Dead Ronin #1 reads like the fight episode in an anime after the viewer has sat through ten dialogue episodes. It's not necessarily a bad thing (and of course those dialogue episodes do get tedious after a while), but there's little context for the first issue here. The reader doesn't really know who's fighting, what the fighting is about or why it's so important. Ideally, future issues will address this, perhaps in the form of flashbacks or something. On its own though, Dead Ronin #1 really acts as a set piece for what is likely a bigger story. Hopefully, Brown lets everyone else in on it at some point down the road. Dead Ronin #1 is available now via Comixology.